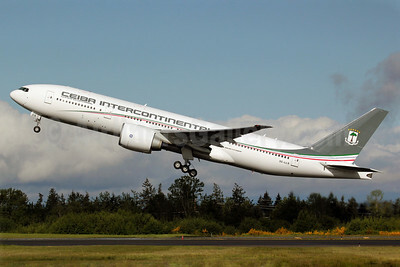 Ceiba Intercontinental Airlines (Malabo) made its historic first intercontinental flight on October 4 from Malabo, Equatorial Guinea, to Madrid. Ceiba will service the route with its Boeing 777-200 LR aircraft. The Ministry of Civil Aviation of Equatorial Guinea purchased the aircraft as the first step in the government’s efforts to meet the growing demand for air service to the country and support its growing economy. Ceiba has scheduled three flights a week on the new Madrid-Malabo route and is part of the African Airlines Association (AFRAA). Ceiba currently offers scheduled service from Bata and Malabo in Equatorial Guinea to several cities in West and Central Africa, including Accra, Ghana; Abidjan, Cote d’Ivoire, Brazzaville, Congo; Douala, Cameroun; Libreville, Gabon; Cotonou, Benin; andLome, Togo. Copyright Photo: Nick Dean. Boeing 777-2FB LR 3C-LLS (msn 40668) takes off from Paine Field near Everett. This entry was posted in Ceiba Intercontinental and tagged 3CLLS, 40668, 777, 777200, 7772FB, aviation, Boeing, Boeing 777, Boeing 777-200, Boeing 777200, Ceiba Intercontinental, Everett, PAE, Paine Field, transportation, travel on October 10, 2012 by Bruce Drum.